My brother and father are set to finish their thru-hike of the Appalachian Trail this Saturday. Actually, it may be Sunday when they finally reach the summit of Mt. Katahdin due to pouring rain and slippery conditions resulting in many falls and my father's pulled hammie. Never-the-less, they are almost finished with their 2,178 mile hike, wildly successful fundraiser for Water for People, extreme bonding time, and toilet-less journey of a lifetime. Yes, it's the lack toilets that really gets me in the end. I need porcelain to survive. 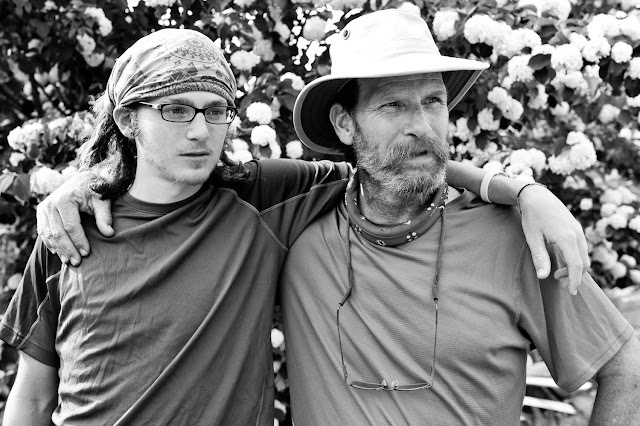 Geoff Green, a photographer doing a documentary of thru-hikers of the Appalachian Trail, snapped this portrait of them when they met in Damascus, VA early on in the trail. I hope he's able to catch back up with them this weekend as they complete their trek. I'm in love with this portrait. Maybe a bit more than I should be because I'm missing these two so much right now. But it really is a great capture. I love the age and wisdom that comes through in my father's eyes. And for some reason I think it will come to be his quintessential portrait. I'm thinking of my father, walking in the rain, in pain, so close to reaching his goal, and digging deep to find the resolve that will get him there. And I know he will make it. My fit-as-a-fiddle, 'I don't get blisters' brother might not survive the process, though. thats an awesome picture!!!! love it.